In the end of 1973, one of the operators behind RPI, came up with the thought of a free radio station. 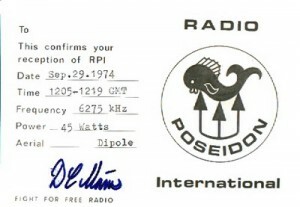 in may-74 the transmitter was bought. It was an old ship-transmitter with an input of 80 watts. Their first frequency was 3387 kHz, but just a couple of reports was send to them, so they decided to make a trial on mediumwave. That was something they should not have done, the transmitter broke down. Now they had to search for a new tx. The next one become a Heatkit DX 60 B with an output of approximately 45 watts and it was crystal driven. So the 29th of September 1974 the first show on the new transmitter was beamed out. First arrived a few reports, and by that they made a real 1/2 wave dipole antenna. The next show consist of some jingles and some records, which was beamed out a couple of times the 29:th of September. 50 reports was send to RPI that time. The DJ’s was DC Mains, AC Mains, AD Mains, Jacky Landbead, Marsh Halloway, Luke Sharp and Michael Linke. 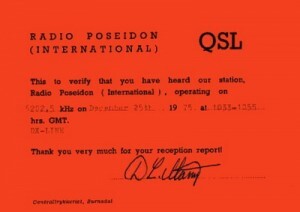 During a visit to England 1975 a new transmitter was bought. This one had an output of 150 watts at 100% modulation. A giant in the Free Radio world by that time. The last time RPI was noted was the 30 of may 1976. They was also connected to FRL.